Magusto, Halloween, Samhain… qual é o nome? Magusto/Magosto, Halloween ou Samhain/Samaín? Como devemos chamar-lhe na Galiza? Todas essas palavras e variantes indicam umha época (nom só um dia ou umha noite) que é esta época que começa em breve e que para nós, Druidistas, é a mais importante do ano. Dito doutro jeito, venhem indicar o mesmo apesar das diferenças de forma, entendíveis pola separaçom geográfica e o passo do tempo. Como Druidistas obviamente nom observamos essa celebraçom mas, a modo de exemplo, seria como discutir se o Natal deveria chamar-se Christmas (em inglês) ou Nollaig (em gaélico), fazendo referência tamém às óbvias diferenças de forma nos EUA, na Irlanda e na Galiza. Claro que é diferente e tem nomes diferentes, mas responde a um mesmo fenómeno. Entendamos que foi paradoxalmente “graças” à invasom comercial do Halloween (desde os EUA) que acabamos por estabelecer a conexom com o Samhain (irlandês) e daí a contextualizaçom e investigaçom do nosso próprio Magusto dentro do seu marco cultural natural que é a Europa Atlântica. Na Irlanda andam no mesmo processo, seja dito, derivado igualmente dum rejeitamento ao comercialismo extremo que chega da outra beira do oceano. É só agora que muita gente lá conhece a realidade do Halloween como umha festa celta exportada polos seus próprios emigrantes e retornada séculos depois com alguns enfeites de mais (por dizê-lo de maneira amável). Mas fagamos memória nós: Quem falava nas ruas da Galiza do Samhain há uns anos? Agora está nas escolas, na publicidade, nos centros sociais, e cria-se umha espécie de “ortodoxia” contra o Halloween como se Samhain/Samaín fora palavra galega (que nom é) e representara melhor algo que percebemos como deturpado no Halloween. Numha reviravolta mais à frente veremos que sempre foi o Magusto quando passe, tamém, a moda do Samaín (em verdade pronunciado ‘sáu-in’), e que Magusto é a palavra a usar na Galiza maravilhando-nos à vez no milenar vencelho da nossa grande cultura céltica. I had always had a certain reluctance in accepting Halloween entering our lives. It is a tradition that we use to link with the USA, with the carved pumpkins and horror costumes, so popularised in the films. This all reached us when shops started to adopt Halloween paraphernalia in their decorations. They found there a new business opportunity that filled the gap between Summer and Christmas. Yet, when we were children, the night of October 31st was always known as ‘Night of the Witches’, and I remember waiting in vain until midnight in the hope of glimpsing some witch crossing the sky on her broom. The truth is that the way Halloween was aggressively introduced and promoted also contributed to that reluctance of mine. Plus, we already had our traditional Magusto (festivity where people gather to eat chestnuts and drink wine), which is normally celebrated from November 1st. Why would I bother with Halloween? There I was, in fact, unconsciously neglecting the lack of studies of our own traditions. It was only when I became an adult that I started to get myself interested in Celtic studies and, in the same way, in the traditions of my own region, Northern Portugal. It was with great amazement that, years later, I found an old black and white picture of an old lady with two boys, sitting on a chair holding a carved pumpkin on her knees. Before that I had only heard some reports and read some odd texts explaining an ancient tradition, linked to the rest of the Celtic world, more embedded in our culture than one might think. As a matter of fact, north of river Minho, in the land that is nowadays known as Galiza (Galicia), this way of celebrating the night of October 31st was kept alive in some villages. The tradition of carving pumpkins is something that elders remember doing “from long time ago”. In those villages, many people thought of it as being connected to other Celtic countries, and not just to our own land, as those traditions were alive and uninterrupted for centuries. October 31st – Samhain – was the end of the Celtic year, when the world of the dead and the world of the living would come together. People used to believe (and some still do) that the souls of the dead could walk in our world. It was the time to celebrate the new year with a big dinner, laughters, friends and family, but it was also the time to conduct religious rites that would allow us to communicate with the Beyond, and have a chat with the loved ones who are no longer among us. Hence, derived from the “headhunting” Celtic custom, skulls were to be lit up with candles, both to protect the living from the evil spirits and to illuminate the path of the good spirits. Those skulls would be left at crossroads, gates, windows or doors, marking and indicating thresholds, passageways. In time, skulls were replaced with turnips and eventually pumpkins. Over the years, I have been collecting testimonies about a not so distant past. One of these stories happened in Ílhavo, close to Aveiro, home to sailors. In a special cultural event promoted by local authorities, residents were invited to open their houses to visitors so everybody could socialise and get to know the way these people lived. On that occasion, my most kind and hospitable hosts were people from the historic centre of the village. Then Mr. Mário told me, among many other things, about the time when he was young, 30 or 40 years ago, when people in the neighbourhood used to fill those same streets with carved pumpkins for Samhain. I was astonished. 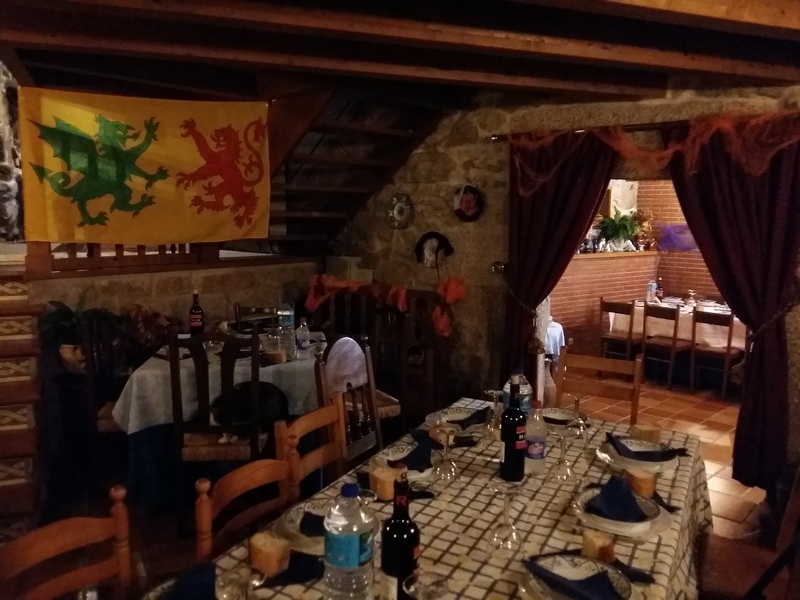 Also, in conversations with my father and mother and with other relatives – all from old Gallaecia – I found out that they all had childhood memories of carving pumpkins for the night of October 31st and that they would all gather to eat chestnuts, sausages and to drink wine. One can only imagine the number of people with similar stories to tell and share. Thus, although the tradition of the carved pumpkins was mostly forgotten in Galicia and Northern Portugal during the 20thC, we can see that from a historical point of view the norm was to celebrate Samhain as done in other Celtic countries, or in the USA by influence of the Irish who emigrated there. Not only that, other significant elements associated to the date such as the respect and reverence for the dead, had always been present. In addition, our tradition offers something of its own, the chestnuts, allegedly said to be a favourite meal in the Beyond! Whether or not this last aspect was common in other countries is a different story. In any case, this was the moment when families and communities harvested and gathered the very last produce given by the land before winter, call it wine, pumpkins or chestnuts. This was the transition from the luminous part of the year (summer) to the dark part of the year (winter), and they celebrated it accordingly, getting ready for some harsh weather but with the confidence it would all pass in the end. It sure is paradoxical, and somewhat ironic, that it was through commercialism that an old tradition was recovered in our country. It sure made many think we were importing yet another new foreign fad, only to discover it was ours all along. It may even annoy us now how American Halloween “twists” the “true” meaning of Irish Samhain, or Galician-Portuguese Magusto. That is however a good sign, as it evidences how we have rediscovered and accepted a part of our own beautiful ancient heritage. – A (CC) 3.0 license applies, where it is permitted to share this text if source is cited, but it is forbidden to alter, re-adapt or use it for commercial purposes. – Aplica-se umha licença (CC) 3.0, pola qual é permitido partilhar este texto sempre que se citar a fonte, mas é proibido alterá-lo, readaptá-lo ou usá-lo com fins comerciais. Click here for more information about the IDG in English.